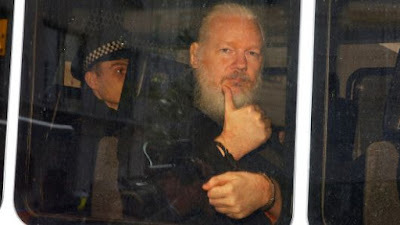 WikiLeaks co-founder Julian Assange was arrested in London to face a charge in the United States of conspiring to hack into a Pentagon computer network in 2010. This has brought an abrupt end to a seven-year saga in which he had holed up in Ecuador's embassy in Britain to avoid capture. The Ecuadorean government suspended the citizenship it had granted Julian Assange and evicted him clearing the way for his arrest. Julian Assange indicated that he would fight extradition, and legal experts stated that the process could take years. Julian Assange's arrest brought to head long-simmering tensions that have raised profound First Amendment press freedom issues. The internal government debate over whether to charge Julian Assange, continued under the Trump administration and was accelerated by Jeff Sessions, the attorney general at the time, according to former officials involved in the discussions. Q. Which WikiLeaks co-founder was arrested in London to face a charge in the United States of conspiring to hack into a Pentagon computer network in 2010?